This week we have a guest post from Michelle Kinane (@MichelleKinane) on the wonderful Jacobs family stallion Silvano. Michelle is a young pedigree enthusiast based in Ireland and has her own blog which can be found here. Owned and bred by Dr. Andreas Jacobs' Gestüt Fährhof, Silvano started out his racing and stud career in his native Germany. Silvano is by the successful German sire Lomitas and is a half brother to Sabiango (by Acatenango), a group I winner in Germany and grade I winner in the U.S. Silvano's dam, Spirit of Eagles (by Beau's Eagle), is a full sister to American grade III and multiple listed stakes winner Big Pal, and is also a half sister to another American black-type winner in Lovely Habit (by Habitony). Silvano is inbred 5x5 to the great Italian racehorse and sire Ribot. The breed shaping sire Northern Dancer appears once in the fourth generation of his pedigree. Silvano won seven races between the ages of 2 and 5, winning in three different continents (Europe, America, and Asia), was named Horse of the Year in Germany, and had a peak Timeform rating of 126. He won group/grade I races in his native Germany as well as Singapore, Hong Kong, and America. A debut winner as a 2-year-old in Bremen in Germany, Silvano returned as a 3-year-old gaining his first black-type success in the Oppenheim-Colonia-Union-Rennen (Ger-II). That win proved to be his only group win as at 3, but he ran some good races in defeat when fourth in the Deutsches Derby (German Derby, Ger-I) on his first start at the highest level. Returning as a 4-year-old he again scored at group II level winning the Emirates Grosser Preis der Wirtschaft, beating subsequent group I winner Catella and high class grade I hurdle winner Laveron. That was also his only win at 4, but again he ran some excellent races in defeat when fifth in that year's Hong Kong Vase (HK-I). Silvano proved to be high class as a 5-year-old, gaining his first group I win in the Singapore Cup on his first start of the year. He then followed up in the Queen Elizabeth II Cup (HK-I), beating a high class field. Silvano's final win at the highest level came in the Arlington Million (gr. IT) in America, beating fellow gr. I winners Redattore, White Heart, and Caitano. While he was a high class racehorse, having not shown his best until later in his career and with a pedigree that is not considered "commercial," Silvano retired to stand in Germany at his owners' Gestüt Fährhof. He had immediate success as a sire in Germany, being named champion first season sire in 2005 and was second to Galileo in the European second season sires' premiership in 2006, siring German classic winner Mi Emma as well as group winners Proudinsky and Fair Breeze in his first two crops. Silvano was originally sent to South Africa as an intended shuttle stallion between the two stud farms of Dr. Andreas Jacobs, Gestüt Fährhof in Germany and Maine Chance Farms in South Africa, but, owing to an untimely outbreak of African Horse Sickness, he was unable to return to Germany after his first visit and remained in South Africa. 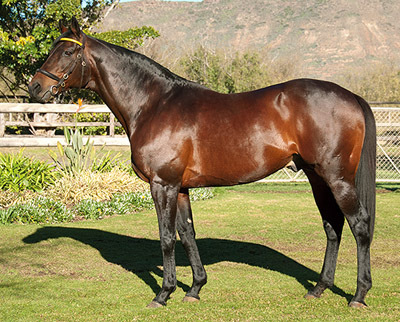 Silvano became a revelation in South Africa, with his first crop containing Kings Gambit, winner of the South African Derby (SAf-I), and Happy Spirit, winner of the South African Oaks (SAf-II). Following the success of his first crop in Germany, Silvano created history by becoming the first shuttle sire between South Africa and Europe when he returned to Gestüt Fährhof in 2009. Silvano has now sired 15 individual group I winners since his retirement to stud, and 12 of those are in South Africa. Some of his best horses include Bold Silvano and Kings Gambit, who interestingly are both out of mares by Al Mufti, a son of Roberto. Silvano has also sired stakes winner Equina and black-type performers Galanthus and Kings Cross from Al Mufti mares, and interestingly he has a group I winner in Flirtation out of a mare by Mullineaux, a full brother to Roberto. He's also had success with daughters of Elliodor, getting group I winner Aslan as well as stakes winners Flax and Tuvana Silva. Silvano's progeny have been very successful in South Africa's group I Durban July, with Bold Silvano having won the race in 2010. Last weekend Silvano's son Heavy Metal improved his sire's imposing record by taking this year's renewal (video below). Heavy Metal is out of a mare by Baroon, a relatively unsuccessful sire but a son of one of Europe's best sires and broodmare sires in Rainbow Quest. This is the same Blushing Groom sire line that has provided Silvano another group I winner in Martial Eagle as well as group III winners Punta Arenas and Forest of Dean. Recently South Africa has added another rich source of sire talent with the acquisition of Oratorio (IRE) (TrueNicks). Before Royal Ascot this year, Oratorio had sired more stakes winners in Europe in 2013 than such sires as Oasis Dream, Dansili, and Dubawi. Silvano—along with Oratorio, the brilliant Var (TrueNicks), and underrated Dynasty—looks sure to be the driving force behind South Africa's racing and breeding industry in years to come.